Josephine Bienenama spent many years of her life working as a civil servant in her home country of Uganda. 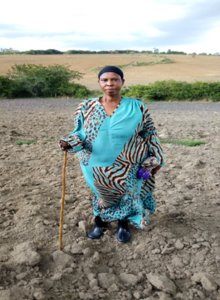 Recently retired from that work, she now divides her time between managing a local community school serving more than 100 local needy and orphaned children and overseeing a small team of farmers a her 1.5 acre plot at The World Food Bank’s Mbarara Farm. Josephine is no stranger to agriculture. She raised three children on a small piece of land near Mbarara, where both she and her husband have lived and worked for many years, growing smaller crops for side income to their work as civil servants. Through this, Josephine and her family have been party to many of the challenges of Uganda’s agriculture system. Since retiring from her civil servant position five years ago, Josephine began working for a local maize plantation before coming to the World Food Bank’s farm. On that plantation, she experienced crops becoming overcome by pests and aflatoxin. Due to these problems, Josephine says she lost most of her former crops post-harvest, as it wasn’t fit for human or animal consumption. Now at the Mbarara Farm, Josephine is is helping to oversee our latest soya crops. She is enthusiastic about the access to storage solutions for the food that she is working to grow, as well as the access to guidance on proper farming techniques she receives from her colleagues. Before coming to Mbarara, she says that she didn’t have access to all of the agronomic services – like advice on planting, spacing, and irrigation – that she has now. Thank you world food bank for profiling this amazing Lady. She has made a very outstanding contribution to the lives and community.